A minority of these people do acknowledge the potential dangers of letting computers run our society. However, the prevailing notion is that AI will be an improvement not only because it can make decisions faster, but because it can make decisions “without emotion”. This ideal is rather malicious when we consider the effects it could have on the economy. True economics always has been and always will be part mathematics and part human psychology. Economics is about human survival, which makes it an emotional matter at its core. The concept of free markets relies on at least partial emotional investment in decision making; without the desire (or option) to improve and succeed, free markets wither and die. But perhaps this is the goal of injecting AI into economics? A common misconception about AI is that it is simply automation; this is not exactly true. Basic automation is considered “assisted intelligence” or “augmented intelligence”, which has existed for many years. True AI is built upon the foundation of “deep learning” and the ability to adapt to experience. That is to say, AI is not just automated, it is theoretically designed to learn and make decisions without further outside input from human beings. Of course, HOW an AI system learns is in fact programmed and indelibly dictates its limitations. Whoever programs the AI determines the scope of what the AI can accomplish and the decisions the AI makes. And who is to stop the programmers from adding a little of their own input here and there for good measure? When AI cheerleaders claim that the system is better because it can make decisions without emotion, this is fundamentally incorrect. The programmers of the AI have emotions and biases and sometimes ill intent. The fallacy that AI is a source of pure objectivity is possibly the biggest lie of the century, and the average person will have no idea why until it is too late. 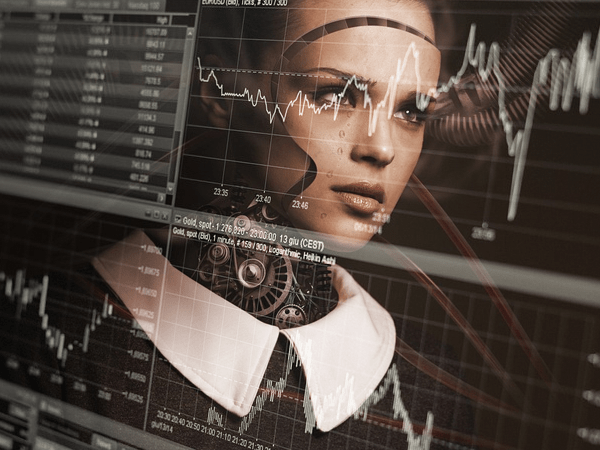 Currently, we can see examples of AI influence in the economy through algorithmic trading in stock markets as well as forex markets. Some of this is simple automation, but trading computers have recently evolved to include true “deep learning”. The results have been strange if not ominous. This trading is primarily reactionary, as algo-computers scan thousands of headlines daily, along with social media opinions and public sentiment. In most cases AI is “bullish” in its sentiment, likely by design. The mainstream media as well as economic gatekeepers, Federal Reserve officials and even Donald Trump understand that by doing nothing more than mentioning certain key phrases in news feeds they can trigger a swift buying trend in markets. To be clear, it is not algo-computers driving markets (yet), but gatekeepers influencing algo-computers to drive markets. AI trading is not in itself to blame for market manipulation, it is just a tool to allow the establishment to manipulate markets more easily. I would note that the bounce in stocks after the plunge in December has been almost entirely driven by headline manipulation and algo-trading, along with a large injection of stimulus by the Chinese central bank. We have heard for the past two months that the Fed is about to “reverse course” on balance sheet tightening and interest rates, and yet this has not happened. In fact, as I predicted at the beginning of this year, the Fed expanded its asset cuts in February instead of capitulating. However, I don’t think that many economic analysts grasp the meaning of this dynamic yet. Consider this: The Fed continues to cut its balance sheet, the same balance sheet that stock markets have been coupled to for the past several years, yet they have been able to conjure a stock bounce for the past two months anyway? How? Through words. Just words. The right words implied at the right time in news feeds that the algos monitor. This is not to say that the fundamentals have gone completely out the window. Stocks are essentially the only sector of the economy still clinging to life. Every other sector is suffering steep declines. The latest bear market bounce does not have much longer to live and by the end of March I believe we will see a return to the same volatility we witnessed in December. What it represents for the future, though, is disturbing. Just as AI-dominated markets can drive prices up artificially without regard for the real economy, so too can AI be used to drive prices down with an engineered crash. Central bankers and their globalist counterparts can now trigger instability through key phrases in the media on top of their ability to inflate and deflate financial bubbles using QE and QT. The agenda behind AI management of the economy does not stop with market manipulation, however. If the crash that is happening now plays out to its logical conclusion, then the end game would be stagflationary crisis and a reduction of living standards to third world conditions. I think it is obvious that the ongoing pro-AI propaganda is meant to condition the public to accept the eventual “solution” of AI economic management in the wake of this disaster. The solution would include full AI control of not only stocks and forex markets, but also automated control of credit markets, interest rates, stimulus measures, etc. And, whoever programs the AI gains centralized powers over all of these systems. This will ultimately extend to currency. The argument will be that AI would not be able to manage an economy effectively unless all money was digital and a cashless society is introduced. I’ve made my utter distrust of the cryptocurrency agenda well known, and this is yet another reason why I continue to be suspicious. Cryptocurrency and blockchain technology is already built to harmonize with AI. Proponents of this outcome are now discussing the use of AI to manage transaction execution among other facets of crypto trading. The illusion being generated is that AI, along with crypto, will erase corruption in trade and politics through “greater transparency”. When crypto cultists talk about the marriage of AI and the blockchain, they usually do so with Utopian stars in their eyes. But transparency in all areas of trade is not necessarily a good thing. As I have long reminded readers, there is no such thing as an anonymous cryptocurrency that is based on blockchain tech. While this was an original selling point of crypto, in recent years many proponents have been forced to admit that anonymity should not be expected. Now, the lack of anonymity is being held up as a selling point instead. With full transparency, we can watch everything the establishment does, right? I find though that history does not support this outcome. In most cases when the establishment seeks “transparency”, what they mean is surveillance on the common citizen while the elites slither under the radar. In a world where every transaction is tracked, where every purchase is cataloged, where every personal interest is logged and profiled and where every place you visit is mapped by AI, there can be no privacy. Without privacy, there can be no rebellion against the prevailing system. Beyond this, implementation of AI to manage the economy immediately calls for further centralization by default. The dream that is projected is that the speed and sheer mass data analysis of AI will create an economy in which there are no surprises; all parts of the machine would be forced to work in unison and nothing would ever be allowed to break. But in order for this to happen, the human element would have to be removed or discounted or controlled as well. The human element would have to be regulated and subjugated so that it can be made more predictable. There are far too many negatives that can come from this. Too many to count. Human ingenuity and the desire for success would have to be oppressed or discouraged because this is considered a “selfish” pursuit in a centralized economic machine. Private trade would have to be eliminated entirely because it is an unknown factor that AI cannot track and collate. Even human population growth would have to be stemmed because it might add new unknowns that might cause a “drain” on the perfect economy. The advantage of AI is that it supposedly operates “without emotion”, so moral implications are certainly never going to be considered in its decisions. Globalist institutions from the UN to the IMF have been avidly involved in the marketing of artificial intelligence as a panacea for all the problems of civilization, as long as it is overseen by the globalists, of course. It is also not a coincidence that an economic world run by AI provides the excuses needed to fulfill the ideology based on globalism. AI makes total centralization a necessity instead of a lustful ambition. While there may be some fantastic and advantageous uses for AI, the idea that it must envelop everything with or without our consent is despicable. The promise of AI is snake oil.